We don't mind telling you that we're more than a little excited for the release of Batman: Arkham Origins. Yes, we know it shares a lot in common with its predecessor - the combat, the movement, the snow-covered Gotham - but we're looking forward to a new adventure starring the caped crusader. 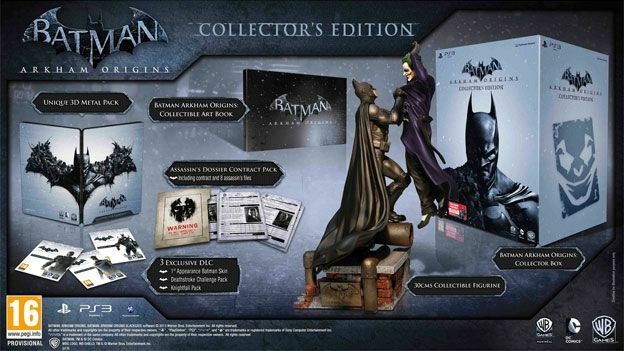 Warner Bros knows we probably aren't alone in that as evidenced by the fact they've just announced a Batman: Arkham Origins Collectors Edition for those Dark Knight fans willing to part with a little more cash on release day. For £79 fans will get a highly detailed statue of Batman holding the Joker up in the air by his lapels, an 80 page hardback book containing art from the game and an 8 file Assassins Dossier. Naturally this will also include a copy of the game in a steel case. More interestingly, however, the Collector's Edition will feature some DLC. There's the Deathstroke Challenge Pack DLC, which is includes two bonus challenge maps and two bonus Deathstroke Skins. Here's the kicker: if you own a PS3 you'll get hold of the Knightfall pack announced at E3 a couple of months ago. This includes a selection of maps that are tied in to the Knightfall story, an “early TV show skin” and an Azreal skin.